[Ottawa – June 9, 2014] – In our rolling poll of the last three days, the new normal of the campaign has emerged – a dead heat between Wynne’s Liberals and Hudak’s PCs. In fact, in the 1,331 randomly sample voters that we interviewed, exactly the same proportion picked Hudak as picked Wynne. This sees the Ontario Liberals surrendering a pretty stable roughly five-point advantage they had sustained for most of the campaign. 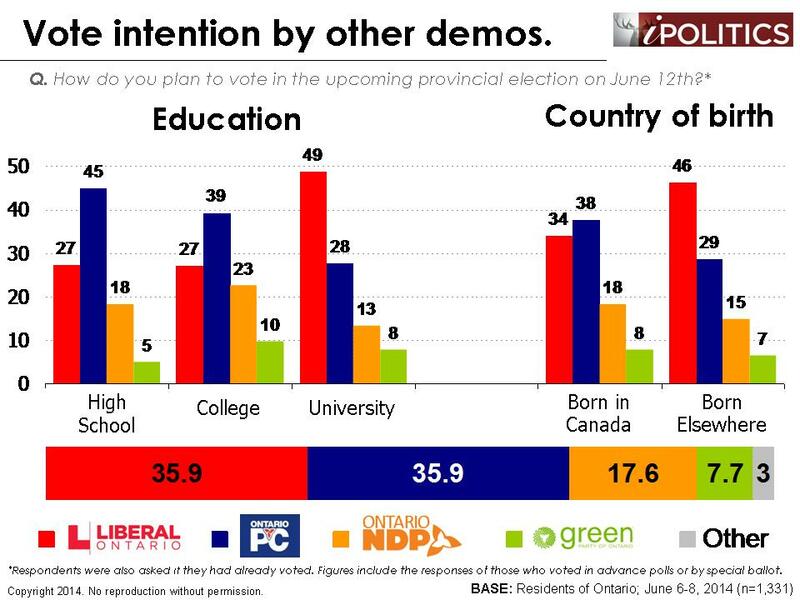 It also sees the surge that we saw on Thursday for Hudak (a seven-point advantage in that day of polling) revert to an exact deadlock. 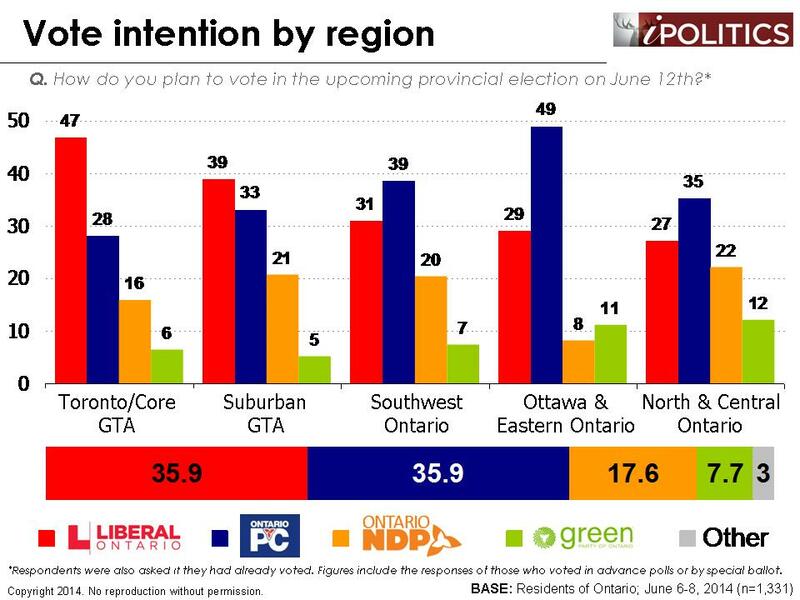 Where things go from here is highly uncertain but with no further changes we predict that Wynne appears to have a significant advantage among those citizens who we think will actually show up on Thursday. We do, however, expect some final twists in what has been a very tight contest from the outset. 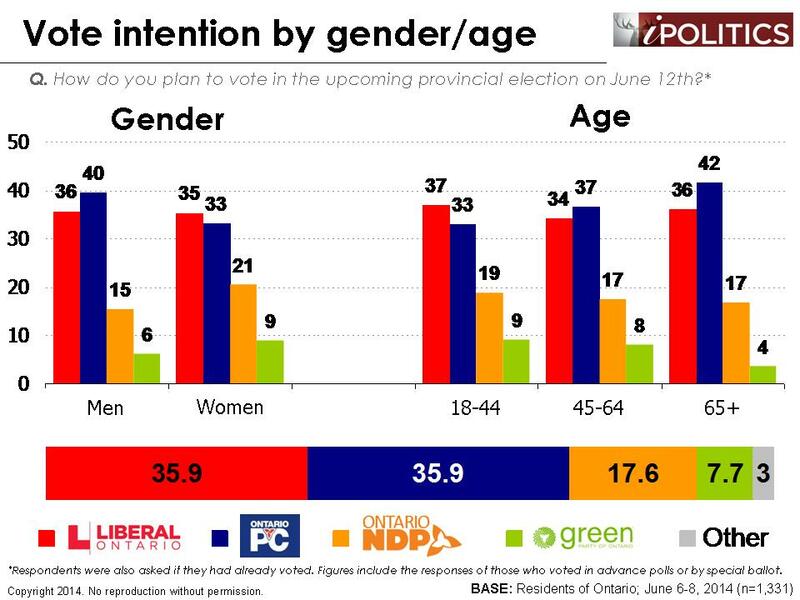 The demographic patterns have remained stable over the last few days, strengthening the evidence that Wynne has indeed lost her advantage with those ages 45-64. This should be particularly troubling for the Liberals, as Baby Boomers are an invaluable voter base, given their propensity to show up and vote on Election Day. On a more positive note for the Liberals, they continue to lead handily in the Greater Toronto Area, which was key to their victory in 2011. 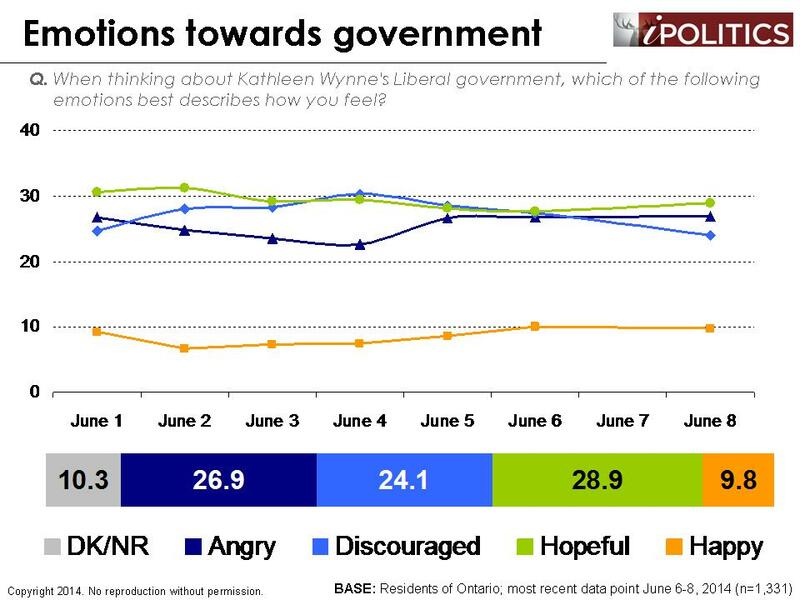 Finally, we are offering up our tracking on emotions towards Kathleen Wynne’s Liberal government. The results reveal a great deal of stability. Wynne’s supporters have largely remained hopeful throughout the campaign while her opponents have alternated between expressions of anger and discouragement. NDP supporters continue to lean heavily towards discouragement, which may give a comparative advantage to the Liberals and the PCs, as hope and anger are far more effective in terms of motivating voters. The bottom line is we do not know which party is going to win on June 12th. The weekend provided absolutely no guidance aside from reinforcing the conclusion that the Liberals and the PCs are in a virtual dead heat. Our likely voter model is a good guess and offers valuable insights into the varying levels of commitment between the supporters of different parties, but we know that our methodology is sound and we are confident that our unadjusted numbers are accurate. Tell the liberals that what they do is OK with Ontario voters. We need higher hydro bills and deals made behind closed doors. Ontario you get what you vote for. Good luck . Moving out of Ontario might be an option. Lots of businesses are doing just that..